Today, Senator Rand Paul (R-KY), chairman of the Federal Spending Oversight and Emergency Management Subcommittee for the Homeland Security and Governmental Affairs Committee introduced a small step in the right direction toward a smaller government. He introduced his “Pennies Plan” federal budget to start to shrink Washington’s spending. “A balanced federal budget isn’t a pie-in-the-sky dream or empty rhetoric. Once again, I am introducing a concrete plan that is achievable and allows Congress maximum flexibility to prioritize spending. It leads the way toward fiscal responsibility, an even stronger economy, and a future full of opportunity for the American people,” said Rand. The Senator's budget plan simply states that for every on-budget dollar the federal government spent in Fiscal Year 2019, it spend two pennies fewer a year (a cut of two percent per year) for the next five years (at which point balance is reached). 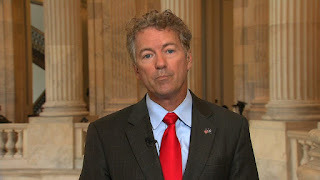 Rand's budget reforms Congress’ reconciliation and budget processes – all without making any changes to Social Security – and includes instructions that would help pave the way for making the middle-class tax cuts permanent and further expanding access to Health Savings Accounts. Of course, I would like to see a sledgehammer and a steamroller taken to the budget but I can support anything going in the right direction.